The Acropolis of Athens is always a stunning complex no matter how many times you go. I have been several times now and still enjoy it every time! The sprawling complex is located in the heart of Athens and is covered in ancient ruins. You can walk throughout the Agora where the greatest philosopher and minds of the time once walked. You can feel the history of the place as you take it all in. The main rock where the Parthenon sits atop is about 300 meters long and about 150 meters wide. The views from atop it show the sprawling city of Athens and the waves of homes that make up this ancient city. While you are exploring the Acropolis do refrain from taking photos where you are jumping. My group decided to do this and the security team deleted our photos and told us if we did it again we would be escorted out..yikes! So treat the temple with respect while you are there! Make sure you bring a good camera so you can get some epic shots! The food in Greece is simple yet delicious. 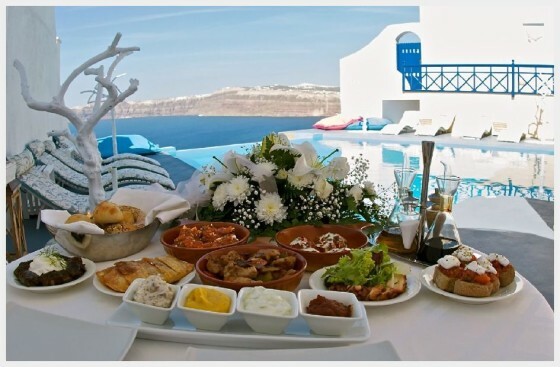 The spread of hummus and peta bread will tease your pallet while you enjoy all that is great with a Greek salad. These are not like the ones you eat in America but the traditional way (no lettuce). The Tapas are delicious and you cannot eat enough of them while your travel the country! My favorite place to eat great Greek food is at one of the many restaurants lining the Acropolis of Athens. At night the Parthenon lights up and the view is simply stunning. Sitting there eating your dinner on a warm summer evening makes you feel as if you are in a fairy tale. This by far is one of my favorite experiences of Athens. If you are looking for a great place to find a lot of restraunts with views try Adrianou, Athina 105 55, Greece. It lies on the edge of the Agora and provides plenty of stunning views of the Parthenon. The Greek islands are what dreams are made of. The cool sea breeze along the coast defines the life and pace of the islands. The white washed stone dwellings on the cliffs give way to the most stunning views you will ever experience. The islands all have their distinct differences from Mykonos, being known as the best Party Island to Santorini, known as one of the most romantic places on earth there are never shortages of things to do in the islands. If you go to Greece you must visit at least one of the islands while there! The deep blue Aegean Sea sears that color into your mind for as long as you live. My favorite Island to visit is Santorini in in the shoulder season because the town dies down and is almost abandoned. All the tourists have left and the streets are empty which also brings a drastic reduction in the price of things. Stay in Oia to enjoy the beautiful views and cottages on the cliff face and rent a moped so you can explore the island. The history of the Greeks is something to be admired. It is full of the greatest philosophers and engineers in history. The mythological stories that you read in school are alive and on full display in frieze’s across the country but if you want an amazing experience go by the Acropolis Museum of Athens. When they were constructing the new museum they discovered that the site sat atop ancient ruins. So instead of relocating the museum they decided to build it above the site so archaeologists could still study and excavate the site. At entrance the floor panels are made of glass you so you can see the site from above as you walk about. Talk about an amazing experience!! What else can you say about Greece other than its stunning panoramic views. No matter where you go you are surrounded by breathtaking views that inspire you to pick up a copy of Plato, sip on some wine and read the day away in a ocean side villa. The views you take in while exploring the country will leave you in such a state of awe that you will never forget the experience. While exploring around Santorini on a scooter you will find beaches of different colors, a city stuck in a time capsule from a volcanic eruption, sprawling vineyards and of course the white stone village of Oia that dreams are made of! While the islands of Greece and the Capital Athens are what most people think of when dreaming about going to Greece. There is the forgotten north that most skip out on. Thessaloniki is a gorgeous sea side city that is full of life. The nightlife there rivals Athens and a lot of the people there are college students. It is definitely worth checking out and spending some time in the northern part of Greece which is easily accessible by high speed train. Greece is by far one of my favorite countries to visit and I make sure I try and stop by every time in a neighboring country. Share your favorite experiences about Greece below!